Hamburg participated in the nationwide deportation to Afghanistan in December and deported 7 people from Hamburg into war, terror and misery. Other federal states like Brandenburg, Bremen, Niedersachsen, Rheinland-Pfalz, Thüringen and Schleswig-Holstein defied the order of the German government and did not participate in the deportations. The city of Hamburg could have also done this but instead the SPD/Green senate chose to realize the demands of right-wing populists like the AfD: more deportations, at any price. According to the senate 479 people from Hamburg are threatened with deportations to Afghanistan – over 100 of them are still minors. The police is supposed to pick up people in dawn raids once a month, to imprison them in detention centers and then to deport them via charter flights to Kabul, where they are abandoned. Afghanistan is not safe, the security situation has deteriorated massively in the past months. According to the UN Mission in Afghanistan there were more civilian casualties in 2016 than in any other year since the start of the systematic counts in 2009. The senate of Hamburg knows this, it deliberately endangers the deportees rights to a dignified life with its actions. The SPD/Green senate is pushing the racist deportation policy to the limits and is thereby openly buttering up right-wing populist forces. The deportations base on the initiative of the senate and can also be stopped by it. What is possible in other federal states, can also be achieved here in Hamburg. On the upcoming meeting of Hamburgs Committee for Interior on the 20th January the deportations to Afghanistan will be debated. The meeting is public. We call everyone to join us at the Rathaus so that we can contribute our share to making deportations from Hamburg impossible. 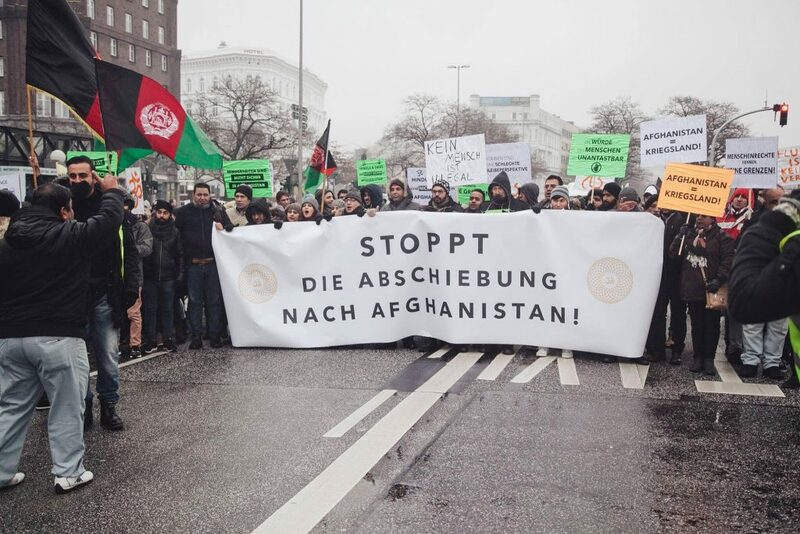 We demand a immediate stop of the deportations to Afghanistan! There will also be a registered manifestation in front of the Town Hall during the meeting, more info soon!